Saburo Kawabuchi told reporters on Tuesday that the Japan Basketball Association is close to securing that its ban will be lifted by FIBA this summer. 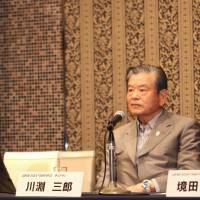 The Japan 2024 Task Force chairman spoke at a Tokyo news conference on the same day after the group’s sixth meeting. FIBA, the sport’s global governing body, originally scheduled a Central Board Meeting from June 18-20 at its headquarters in Mies, Switzerland, but it was recently moved to Tokyo from Aug. 7-9. In the meeting, the host nation for the FIBA 2019 World Cup will be selected from China or the Philippines. 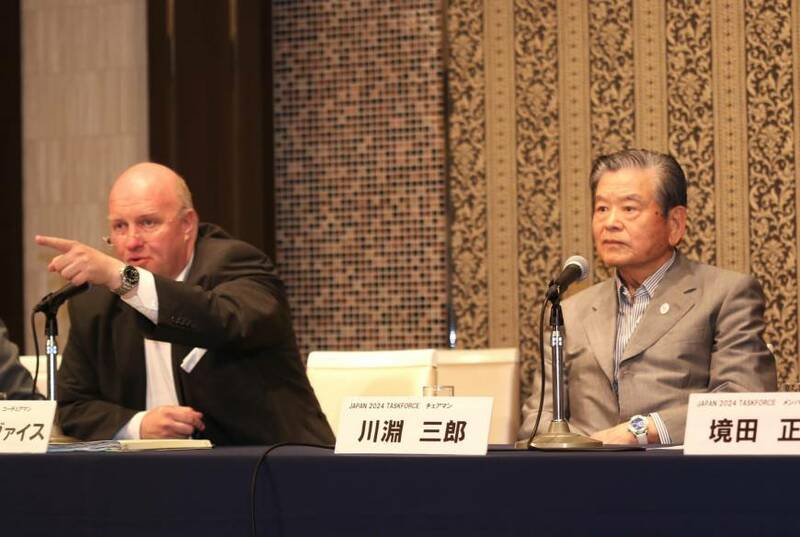 The official reinstatement of the JBA would have to wait until the Central Board Meeting, but task force co-chair Ingo Weiss said that the suspension will “partially be lifted” and Japan’s national teams would be permitted to participate in international competitions even before the official resolution is made. Before a planned mid-June FIBA Executive Committee meeting in Geneva, where officials will discuss the matter, Weiss, FIBA treasurer, said that he was confident to give the green light to Japan’s national teams for the FIBA Asia Under-16 championship (Aug. 2-9) and the Summer Universiade in South Korea (July 3-14). But the men’s and women’s top national teams will have to wait until the Central Board Meeting to get clearance to play in the Olympic qualifiers during the summer. Weiss emphasized that Japanese teams would have to get permission from FIBA before the ban is lifted officially, but he added that training camps in and outside of Japan would not be the case. “It’s been four months (since the task force team was formed) and now we have a legitimate chance that the ban will be lifted,” Kawabuchi said with a smile. Among the major demands that FIBA pointed out to the JBA, Kawabuchi said that the merging of the two men’s top leagues, the NBL and bj-league, would originally be the toughest job to get done, but the governance issue of the association (it was told that it had no control of local basketball associations and schools, among others) was actually a much trickier problem. “I didn’t think that the issues of the development and governance would be big problems to overcome,” said Kawabuchi, who was appointed the new JBA president last month. “But actually, the governance issue was harder. Meanwhile, the applications of four clubs to join the JPBL, the new men’s circuit that is scheduled to tip off in the fall of 2016, have been put on hold as they didn’t fully meet the criteria that the task force had imposed. The four are the NBL’s Wakayama Trians and the bj-league’s Rizing Fukuoka, Oita HeatDevils and Hiroshima Lightning, an expansion team for the 2015-16 season. Wakayama, which fell into financial problems and changed management companies during the 2014-15 NBL season, was prohibited from playing in the NBL’s 2015-16 season because it didn’t present necessary documents to be screened by the league office. According to the task force, the Trians would be inspected further, while it sees Wakayama’s potential participation in the JPBL’s third division in the future. Fukuoka, Hiroshima and Oita, which will actually move to Ehime Prefecture under a new management company for the next bj-league season, weren’t able to submit documents that prove that they have overall support from their respective prefecture’s basketball associations. The task force made it clear that they would be admitted into the JPBL if they submitted the necessary papers by June 15. The 43 other clubs have been approved. The divisions of the clubs was originally be announced at the end of July, but there’s been a slight change to that plan. Kawabuchi said that the JPBL would reveal around 10 clubs for the first division, which is expected to be numbered between 12 and 16, at the end of July, and it would choose the rest and announce them a month later. The task force also made a structural change to the JPBL. Originally, the organization was to be formed with three divisions, but because it found out that there were too many clubs that had problems financially and managerially, it came to the conclusion to form with pro teams of the top two divisions while the third division would be run by another company. Patrick Baumann, FIBA’s secretary general, attended Tuesday’s task force meeting, but did not stand at the podium along with Kawabuchi and Weiss at the news conference, as he allegedly said that he was just there as an observer.